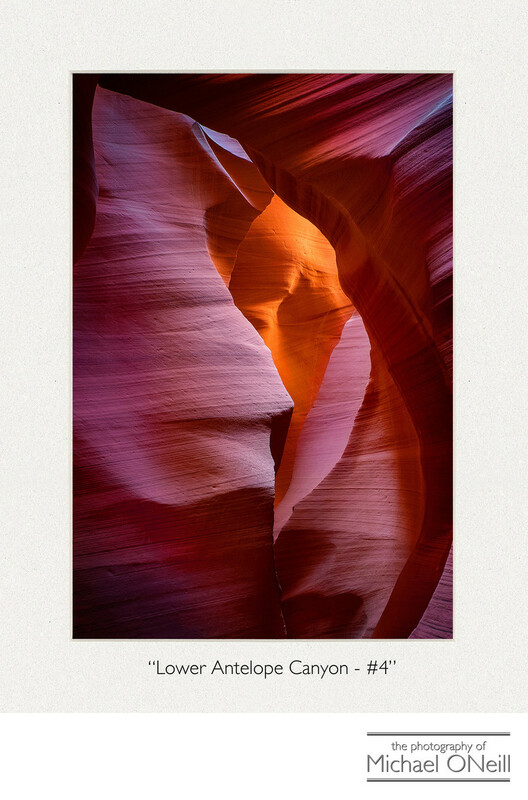 "Lower Antelope Canyon - #4". This is another one of the striking images I captured while visiting the slot canyons in Page, Arizona. A slot canyon is a narrow canyon, formed by the wear and tear of water rushing through rock. A slot canyon is always deeper than it is wide. Some slot canyons can measure less than 1 yard across at the top but drop more than 100 feet in depth at the canyon floor. The sandstone and limestone rock that make up the walls of the canyon are steeped in beautifully saturated colors ranging from light yellows and oranges to deep reds, magentas and blues. These canyons are a photographer’s paradise. It’s really tough to take a bad picture down in the canyons. Everywhere you look there are unique rock formations which change in color and depth as the sun moves overhead creating an ever-changing environment. A short distance away from Lower Antelope Canyon is Upper Antelope Canyon. It was in that location that photographer, Peter Lik, created his renowned photographic creation, "Apparition". Unsubstantiated reports claim that "Apparition" was sold to an anonymous private collector for the unbelievable sum of six million dollars...making it the most expensive collectible fine art photograph of all time. Most experts are skeptical of the claimed sale. On a more positive note "Lower Antelope Canyon - #4", as well as any of my limited edition fine art photographs can be acquired for the much more modest price of $99.00. Check out the contact page of my web site or any of the galleries that offer my works for more information.